Ling House (1899-2006). The Ling Physical Education Association became The Physical Education Association of the United Kingdom (PEAUK). In 2006 PEAUK joined with The British Association of Advisers and Lecturers in Physical Education (BAALPE) to become the Association for Physical Education (AfPE), becoming the United Kingdom's only Physical Education subject association. Folk Dances from Many Lands, a series by Ling Physical Education Association of Great Britain and Northern Ireland. 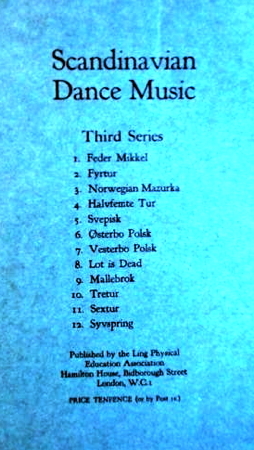 Scandinavian Dances, a series by Ling Physical Education Association of Great Britain and Northern Ireland.